Preheat grill to high. Mix 3 Tbs. olive oil, salt and pepper (to taste), and minced garlic. Add chopped spinach, basil and oregano, diced tomatoes and onions. Toss to coat mixture. Set aside. Spread 1 tsp olive oil over surface of a 15 inch cold pizza stone. 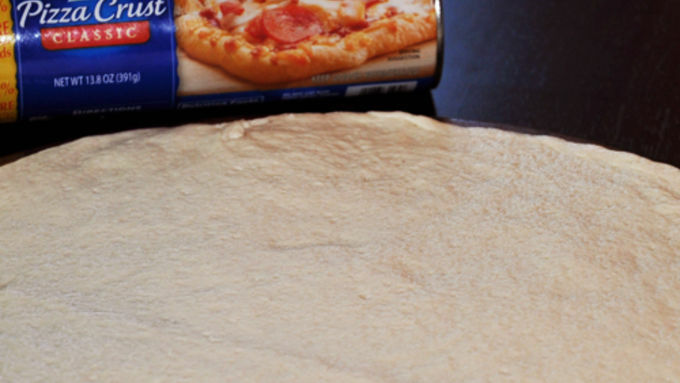 Open refrigerated pizza crust and spread dough to fit stone, stretching and forming as necessary to fit shape. Add stone and crust to hot grill and reduce heat to medium-high. Close lid and bake for 3 to 4 minutes (do not overbake at this stage), just until light brown. Open grill lid and sprinkle feta cheese evenly over crust. 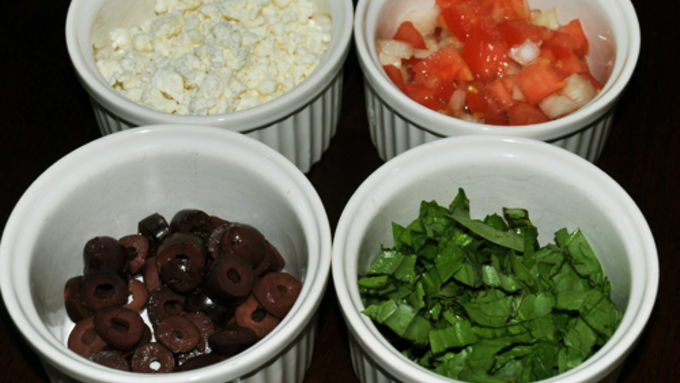 Sprinkle leafy greens, tomatoes and onion mixture over cheese, and top with sliced kalamata olives. Close grill lid and bake an additional 2 minutes or so, until feta cheese is hot and gooey and other ingredients are steamy. Turn grill off. Using grill mitts, carefully remove stone and pizza from grill. Slice and serve immediately. No pizza stone? No worries -- use a pizza pan or cookie sheet instead. Watch carefully to avoid over-browning the crust bottom. All grills are different! Your pizza may bake more quickly or take longer. Keep an eye on it to make sure it doesn't bake too fast, and adjust temperature and times accordingly. 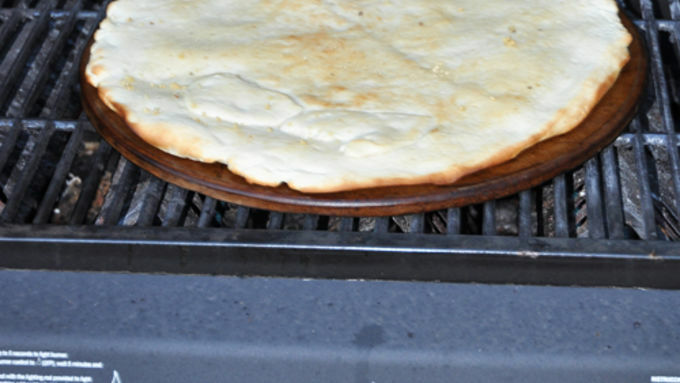 This makes a thin-crust pizza, reminiscent of Mediterranean flatbread. If you like thicker crust, combine 2 tubes of refrigerated pizza dough and adjust baking times accordingly. In the heat of the summer, firing up the oven indoors makes about as much sense as kicking the furnace into gear. Ugh. But summer is the awesomest season for pizza, especially with all those ridiculously fresh veggies out there screaming for attention. So, short of getting out your wallet and phone book and calling one of those famous pizza places that seems to be in every town, what's a cook to do? Voila! 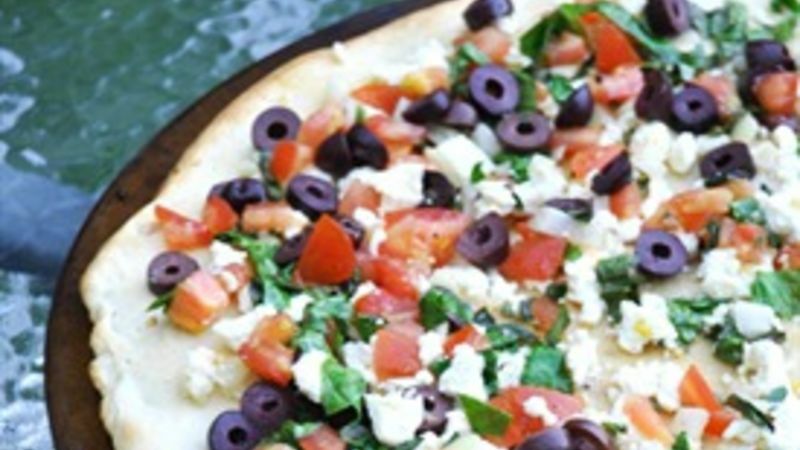 Fire up the grill instead and make this incredibly munchable Grilled Greek Pizza! Like hummus? It's not included in the recipe, but slather it on before adding everything else if you'd like. It adds a great flavor to the base. Then go for it with all you've got: Add the feta cheese first, then the veggie mix, then the olives on top. Seriously, when you're throwing down all that beautiful stuff over the crust, you feel like a gourmet chef. It smells good, it looks good, and you just know it's gonna taste good. Is this what it feels like to be Bobby Flay? (Dreamin' ...) Cut 'er up and pair it with some chilled pinot grigio and call it gourmet Greek night. More Greek Goodies If you like the taste of Greek ingredients, try a few of these recipes too.